Many athletes are familiar with the term “turning it on” or “turning it up,” typically in reference to a great performance or improvement in play. “They really turned it on in the second half” or “They turned it on in the third quarter.” The frustrating part for those athletes, though, is that they sometimes cannot control when the magic happens. Sure, they can train well to put themselves in positions to have great games, but very few athletes have the ability to flip a switch and ‘turn it on’ by command; those who possess anything close to controllable magic may go down as some of the best to ever play their respective sport. Thankfully, in the world of process control, a system exists where it is possible for a control element to be determined by either being turned on or off: on/off control theory is based on the idea that there are two positions for a specific control element, i.e. open or closed. The lack of a middle-ground position may sound absolutist at first, and it’s not the most complex method employed by process controllers, but there are distinct advantages to the on/off system. For example, on/off control is often used industrially; however, basic home appliances such as fridges and ovens both utilize on/off control. The oven and the fridge are both used for straightforward purposes, matching the control method – such is why on/off control is not very popular for use in a commercial setting requiring a wide range of complexity. Another prime example of on/off control is a heating system, where, when the house gets cold, the heater turns on, and when the house reaches a certain temperature, the heater turns off. The process variable, in this case the temperature, is determined by the output, meaning that when the output crosses a certain threshold, the change occurs in the system being switched from either on to off, or off to on. Due to the aforementioned nature of the controlled output being either 100% or 0%, this method of control is not the best for every application. One of the most common uses for on/off control relates to HVAC systems, where maximum output is being delivered or the system is off. To prevent nearly constant oscillation between the desired temperature and the range either above or below, a staple of on/off control oriented processes is the deadband. A deadband is essentially the process control equivalent to a demilitarized zone, a designed neutral space where no change in the output signal occurs. Let’s say the heating thermostat in a house has a setpoint of 65°F. If the deadband range of the thermostat is 4°F, the furnace will start when the measured air temperature is 61°F (65 minus 4). The furnace will run until the air temperature reaches 65°F. The deadband, depending on the capability of the controller, can sometimes be repositioned in relation to the setpoint, but the key function of deadband remains the same. No change in controller output state occurs while the process variable, in this case room temperature, is in the deadband. This keeps machinery from rapidly cycling on and off, with resulting excess wear and tear or other negative consequences. The deadband compensates for the disadvantage of such an on/off control system in terms of absolution. Another process which illustrates on/off control is a liquid tank filling operation. When liquid in a tank reaches a certain level, level sensors and switches exist which, upon sensing the liquid at a predetermined level, will send a signal to a controller, causing a fill valve to close or pump to cease operation. The same elements which make on/off control appealing and compatible with some processes also render some disadvantages when applied in other scenarios. The aforementioned rapid cycling may have been somewhat corrected thanks to the theory and implementation of the deadband, but issues relating to the black-and-white operational principle also provide a potential drawback in different systems. A delay with a time value greater than zero exists in a good amount of practical on/off control situations where ‘dead time’ impacts the time it takes for an on/off position to switch. This means the value thresholds established for each position may be crossed before the opposing position kicks in to bring the value back to within the intended control range. For processes requiring strict value limits to be maintained with little or no margin for error, this particular truth of on/off control is extremely hard to ignore. Also, systems which are working together to form a more complex, connected process are rarely used in conjunction with on/off control because when the oscillations in on/off controlled systems occur – especially in processes where deadbands are inapplicable – they could ricochet through the connected system and introduce unforeseen complications and process instability. The ‘overshooting’ of the element being controlled is a common risk to consider when evaluating the potential disadvantages of on/off systems, causing them to be typically incompatible with environments where precise regulation is required. 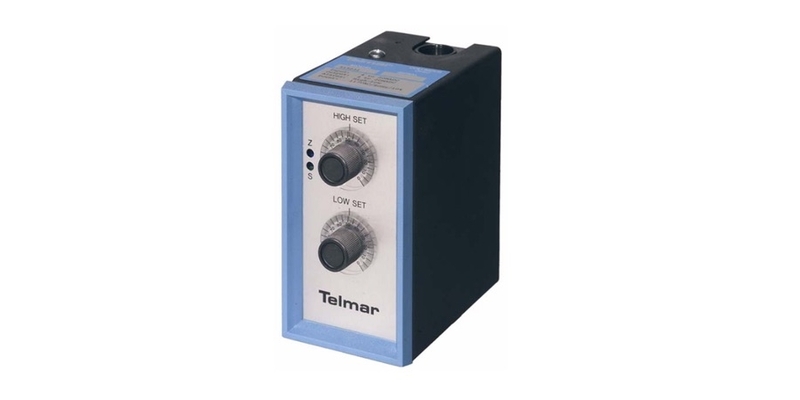 That said, the relatively low cost and simplicity of this process control method makes on/off control a rugged and long-lasting choice for systems which can function well within the limitations of the controller. Properly applied, on/off control methodology can provide an inexpensive and effective solution that is easy to apply and maintain. Analynk, under their Telmar brand name, manufactures numerous analog devices that can be applied in a process control application. Share your process control challenges with product application specialists, leveraging your own experience and knowledge with their product application expertise to develop effective solutions.